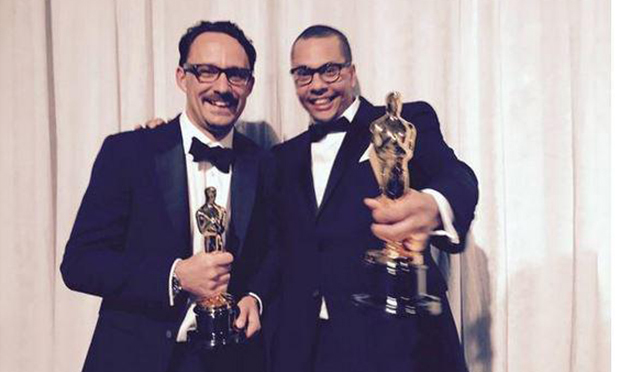 Hackney filmmaker James Lucas is celebrating winning his first Oscar. The Phone Call, which Lucas produced and wrote alongside his friend Mat Kirkby, is the moving story of a woman working for a crisis helpline who tries to persuade a pensioner from a suicide attempt following the death of his wife. The film, which stars Sally Hawkins and Jim Broadbent, won Best Live Action Short Film, with Lucas, who lives in London Fields, saying the moment the film won was “the best night of my life”. “How can you better than that? It was just an incredible experience, very moving, very exciting and just a beautiful experience,” said Lucas, on the phone from LA. In an interview last year with the East End Review, Lucas said that after Hawkins accepted the role, the project went on hold for ten months until she had finished filming Blue Jasmine. Then ironically, Jim Broadbent joined the cast just two days later. “You get someone like Jim Broadbent straight away because he would love to do it opposite Sally,” said Lucas. After an eccentric acceptance speech by Kirkby, in which he referred to the awards as “big buggers” and talked about doughnuts, the filmmakers paid tribute to their mums, and to the film crew, who worked for free on the film. The pair also spoke of their ambitions to make feature films in the future, with them both hoping to attract the attention of Hollywood producers for new feature scripts. A move to LA could even be on the cards for Lucas, who was born in New Zealand though has lived in London for 15 years.